There are so many situations that a pipe can find itself in and in every case it will need to be supported. Pipe supports is a general term that actually is split into two families. There is what I call the primary pipe support systems, and then there are the secondary pipe support systems. The primary pipe supports systems are those supports that are a part of the infrastructure and fall under the prime responsibility of the structural department. The secondary pipe support systems are more a part of the piping systems and as such fall under the prime responsibility of the piping department. You notice I used the words 'prime responsibility' with each of these there is still a cross over responsibility to provide proper, accurate and timely information and then action. As noted above the primary pipe supports are a part of the infrastructure. This is true of most all projects. For simplicity the emphasis here will focus on "Grass Root" or new construction plants. These primary pipe supports systems may also be referred to as piperacks, pipeways, pipe alleys. These support systems may be major or minor and they may be overhead or sleeper pipe racks. It is important to understand that even though they are called pipe racks they support and carry more than just piping. These other items may include the cables for electrical and instrumentation services. For clarification, overhead pipe racks are elevated to the point where you can walk and/or drive under the supported piping. Sleepers or sleeper ways are low to the ground so there is no passage under the supported piping. Pipe racks (overhead or sleeper) are normally established and sized early in the preliminary engineering phase of a project. This time of the project is normally called the plant development phase or the plot plan development phase. Once they are established and sized they are one of the first things the structural department can work on. The terms 'establish' and 'size' requires a lot of wisdom and work. The wisdom and work means thinking one, two or three years into the future and deciding where (location) the primary pipe support systems will run. Other critical elements include the configuration, height, width, spacing and the materials of construction/fabrication method. Let's take these elements one at a time. Location In order to set the location of the primary pipe support systems the total plant layout must be established. This means that all the various disciplines must have a very good idea what equipment is required and it's size. The "Plot Plan" must be reviewed by all the key people on the project and then approved by the client. This is the selection of "fit-for-purpose." Each main run, minor run and branch run must be looked at to determine its configuration. Will it be an overhead rack or a sleeper way? Will each be single deck (layer) or multiple deck? Will the support be a single column ("T") support or multi-column support? A second part of the configuration issue effects pipe racks in the process units themselves. This is the question of whether or not the pipe rack will support equipment such as Air Coolers (Fin Fans). Another part of configuration is the issue of intersections. Poor planning on this issue can cause problems later with the piping. How high should each run of rack be? Should they be elevated or low sleepers. The sleepers are concrete with an imbedded steel plate on the top. For sleepers, they need to be off the ground to allow for maintenance and drainage also to prevent corrosion. For elevated multi-level racks what should the separation be? For elevated racks you must plan the height and the separation of the whole system together. A key element in the determination of separation is the line sizes to be carried on the racks. Width This requires a detailed study of the total piping systems for the whole plant based on pipe rack routing. In the past, a study (called a "Transposition") was done to, as best you could, account for each line on each pipe rack. From this study, a berth sequence was established and the line spacing set. A percentage was added as an error factor and then the clients "future" reserve was added. This then constituted the minimum rack width. The final width would be set after all racks were "sized" and then some might be rounded up in width for consistence based on the materials of construction/fabrication method. This issue can be addressed after the transposition has been completed. The transposition identifies all the rack piping from the largest to the smallest. From this the average line size for each leg of the rack system can be established. With the pipe size information (largest, smallest and average pipe size) the number and spacing of the pipe support bents can be set. A cost tradeoff is evaluated and made between more pipe supports spaced closer together or fewer pipe supports and some sort of intermediate support system. Materials of construction/fabrication method What materials are the pipe racks to be made of and what will be the fabrication method? Pipe racks can be bare steel, steel w/a concrete encasement (fireproofing), reinforced concrete or a combination. The steel can be steel structural shapes or pipe shape. The concrete fireproofing can be cast in place onto (or around) the steel columns and beams or it can be pre-cast onto the columns and beams prior to installation. The reinforced concrete pipe supports can also be cast in place or pre-cast then field erected. The space requirement dimensions for a reinforced concrete column or beam is about twice that of bare steel. The piping design group on the project (at the company where I came from) was the lead group in all of the above issues except the last one, materials of construction/fabrication method. This issue was properly the responsibility of the structural department, construction and the client. There is no doubt that economics, the jobsite location, labor and material availability played a part. Piping, however must know what the materials of construction/fabrication method will be because it can affect one or more of the other issues. The secondary pipe support systems are a broad family of devices with two branches and actually include more than just supports. The two branches are defined as (a) "engineered" devices and (b) "miscellaneous" pipe support devices. The term "engineered" pipe supports relates to devices that are non-static, one-of-a-kind, location and condition specific. They are identified at the time the need is recognized and then designed and engineered for that specific need. Constant support spring hangers and snubbers are just two of the devices in this category. The piping stress engineer is the party/person who is responsible for the engineering of these. However, the piping designer working in the specific area has a shared responsibility. The term "miscellaneous" pipe support refers to a broad array of devices that includes items such as Anchors, Base Supports, Cradles, Dummy Support Legs, Guides, Hanger Rods, Pick-ups, Shoes, Trunnions, etc. All companies have their own operating methods and may not use a different approach to miscellaneous pipe support devices. Some may allow each piping designer to pick and choose pieces and parts from various catalogs to design their own pipe supports. Others may use a more organizational approach and "pre-engineer" these supports. The term "pre-engineer" means that the various devices are an existing company standard that may be used on the project. Secondary support devices typically have multiple or repetitive point of use subject to similar conditions. Having these devices "pre-engineered" and available to the piping designer on the project saves money, provides consistency of design, and results in a safer design. The configurations, hardware and materials have already been established, the load calculations have been performed (and are on file). There is also an "If-then" selection key and criteria established (If you have "X" support problem, then you can/must use "Y" support device). The extensive use of computers and plant design software makes this approach more viable. Having these support devices "pre-engineered" and documented allows for the inserting of the item's specific electronic symbol required for model generation and document (plans, elevations and isometrics) extraction. A catchall term sometimes used by a piping designer that includes any type of non-infrastructure support. These items are not location specific. A wide verity of top-down pipe supports situations, not location specific. Prevents or controls mechanical vibration in piping systems. Provides additional mass for thin wall pipe at a point of concentrated stress loading. This item is not location specific. Provides support of pipes from other pipes or overhead beams and is not location specific. Provides load-carrying points for vertical pipelines most often used to support pipes attached to tall vertical vessels or hung from tall structures. Note #1 – This item is normally used only for (a) services subject to heavy vibration such as at reciprocating compressors or (b) services that contain highly hazardous or toxic material. Note #2 – This item is normally only used for the suction and discharge piping at reciprocating compressors. Anchors –The anchoring of a pipe in place can be achieved in a number of ways. An anchor will normally require some additional material regardless of the line size. You cannot just weld a pipe to a pipe support. For some small lines in the right situations you can use “U” bolts over the pipe (tack-welded to the pipe) and through-bolted to a bare steel pipe support. Another way for small line sizes (2” and 3”) uses 1-1/2” angle iron 6” long. Weld one leg of the angle iron (horizontal) flat to the top of the pipe support with the other (vertical) leg against the pipe. Stitch weld (1” fillet weld on 5” centers) to the vertical leg to the pipe. For larger lines use a pipe guide to restrain the side-to-side movement and add a piece of steel (“T” or channel) to the bottom of the pipe (or shoe) at the pipe support to restrict longitudinal. Anchors will be required for both bare (uninsulated) pipe and insulated pipe. The requirements for anchors for cold insulated and hot insulated pipe is different. Base Anchors – This will occur most often at control valve manifolds (or stations) situated close to grade or a platform. Base anchors are simply a stub of pipe (dummy leg) attached to the lower portion of an elbow and extended to grade (or platform). A square steel plate is welded flat to the pipe. The plate may have holes in it and be cinch-anchored to the paving or welded to platform steel. The sizing of the “pipe leg” can be the same as for Dummy Legs. Base Guides – This item is constructed of the material and methods as the base anchor except that the bottom plate is not bolted or welded down. For this item angle iron strips are installed on two opposite sides (depending on desired movement) to control the direction. Base Supports – This is another name for one of the items that sometimes falls under the name Field Support. This item also has a dummy leg type pipe extension (or stub) welded down from an elbow. However, the bottom end if the stub is threaded using a straight (conduit) thread machine. A straight thread, conduit coupling in then used to make height adjustments to the support. When this is required for high cost piping materials that require post weld heat treating the stub is shortened and added in the shop. The balance of the stub is added in the field from carbon steel. Another variation of this is restricted to small diameter piping. For this a 3’-0” (1 meter) length of 3”x3” steel angle is welded to a 6”x6” plate. Holes are drilled in the angle at the proper elevation and a “U” bolt secures the pipe to the angle. Cradles – This device is normally fabricated from carbon steel that is shaped to fit the outside diameter of cold insulation. The potential number of sizes for this item can be vast. The sizing requirements are based on (a) the pipe size, (b) the insulation thickness, (c) the load bearing capability of the insulation, (d) the length of the required cradle and (e) the thickness of the cradle material. The pipe size, the insulation thickness and the load bearing capability should be easy to understand. The length if the cradle is influenced by questions such as: Does this line require an anchor at this cradle? What kind of pipe supports do we have at the point of this cradle? How much thermal movement will this line “see” at the point of this cradle? All of these items effect the cradle length. If there is to be an anchor at this cradle and the forces are substantial then the cradle thickness may need to be increased. Directional Anchor – This item could also be called a Directional Guide and is most often associated with hot piping. This item is designed to allow for thermal movement in a specific axis. The design may require longitudinal movement or it may require side-to-side movement of a line. This item has two versions, one for longitudinal movement and a second for the side-to-side movement. Remember this most often occurs in hot piping. Hot piping also requires shoes to elevate the line and the insulation above the pipe support. So we have a pipe, a hot pipe, already on a shoe. Now, to allow for longitudinal movement we simply add (weld) Guides to the top (steel) surface of the pipe support. To allow for side-to-side movement in the pipe we DO NOT ADD GUIDES. We add two pieces piece of steel (“T” or channel) to the bottom of the pipe shoe, one on each side of the pipe support with a small (1/4”) gap to avoid binding. Dummy Support Legs – (or Dummy Legs) – This is simply a piece of pipe extended from an elbow to provide support when a pipe line enters or leaves a pipe rack short of a support and is left improperly support. A stub or length of pipe sized to carry the load is welded to the elbow and extended beyond the support. The length and the wall schedule of the pipe extension are a rather complex formula based on the parent line size and the total load. The total load is based on the distance (indirection of flow) from the last support to the drop, the distance of the drop, the distance from the drop to the next support, the weight of any insulation plus the weight of the hydrotest water or commodity which ever is greater. Field Supports – This “catch-all” term is used to describe a simple piece of steel angle or channel welded to a column or beam intended to provide a support point for a pipe. As mentioned above (Base Support), this term is also used for the support under control valve stations and pump suction or discharge piping. Guides – Guides are predominantly in elevated pipe racks or sleepers to keep the pipes in their assigned berth. Guides are most often short lengths of properly sized steel angle welded to the pipe support on each side of each pipe. For small lines using small angle the angle is installed with the point up, like a pyramid. For larger uninsulated lines with larger angle one leg of the angle is flat on the support and the other is vertical. For the installations of guides care must be taken by thew installers to leave a small gap between the pipe and the angle to avoid binding. Because of the close spacing of the pipes in a rack guides are attached to alternate pipe bents in staggered fashion. Gussets – This is a simple piece of angle steel welded or clamped to a header pipe and to a (small) branch to prevent breakage due to vibration or other action. There are some locations and services where the use of gussets is highly recommended. Hanger Rods – These devices are one of the most dangerous items used in the piping field. In many if not most cases they are not properly “designed”. Hanger Rods, Rod Hangers and Pipe Hangers all terms for the same device. There are three basic types of Hanger support devices: (type 1) beam-to-pipe, (type 2) pipe-to-pipe and (type 3) beam-to-beam (or trapeze). In general they all have three components, a top connection component, a connector component and a bottom component. For the type 1 Hanger the top component normally connects to a structural beam. The connector component is normally steel rod. The bottom component is normally a pipe clamp. For the type 2 Hanger the top component is also a pipe clamp. Other components are the same as type 1. For the type 3 Hanger there are two top connector components and two connector rods. The bottom component is a piece of steel angle or channel sized to span the distance and carry the intended load. The danger with the design of these items is in the lack of knowledge of the people doing the design. They do not know how to calculate all the actual dead and live loading that the Hanger will support. Then they choose the wrong type or strength of component for the intended load. Hold-Downs – These items are a combination of clevises, steel shapes, bolts and compression washers. The are used to hold down the piping on the suction and discharge of reciprocating compressors and pumps. Normally this type of piping is low to the ground and supported on sleepers. The hold-down is a bridge assembly over the pipe and welded to the sleeper steel plate. The combination of clevises, steel shapes bolts and compression washers exert tension on the pipe to suppress vibration. Load Distribution Pads – This is simply a 120 degree section of pipe about 18” long. The Pad is cut from the same material as the subject line. The Pad is opened up a little to fit the pipe O. D. and then welded to the pipe at the required location. Pick-ups – This is a set of devices used to provide intermediate support for small diameter piping that will not span the existing distance. Its use is normally restricted to locations where the small size pipelines run parallel to one or more large diameter pipelines. This is also used to save the cost in time and material from adding a formal (primary) structural pipe support. This is simply a length of properly sized, steel angle and one or more “U” bolts. The angle is cut long enough to span under both the supported and the supporting lines. The “U” bolts are sized based on the large pipes that will be doing the supporting. Shoes – This device is required to raise a hot insulated off the structural support surface. The reason for this is to prevent damage to the insulation as the pipe expands as it heats up and shrinks as it cools down. For pipe sizes 3” thru 10” a simple inverted “T” shoe with a flat bottom plate and one (single) vertical plate should be used. For pipe sizes 12” thru 18” a shoe with a flat bottom plate and two (double) vertical plates should be used. For pipe sizes 20” and larger consideration should be given to the addition of a Load Distribution Plate (see above) where thin wall pipe may exist. The material for pipe shoes will normally be carbon steel. However, where the pipeline is an exotic material this would cause a weld of dissimilar metals to exist where the shoe is attached to the pipe. For shoes used on exotic materials only the bottom plate is carbon steel. The (single or double) vertical plates are made of the same material as the pipe. For piping that requires post weld heat treating (PWHT) after fabrication the shoes must be added by the shop. Some company’s (engineering and client) will also require the use of shoes (with the Load Distribution Pad) for all uninsulated 24” and larger piping where the pipe wall is below a certain limit. Trunnions – For this device a vertical pipeline will have two (2) stub pipes attached horizontally to opposite sides of the pipe. One end of these stub pipes is shaped to fit the O.D. of the vertical pipe the other end is normally square cut. The shaped end of the stubs are welded to the vertical pipe with a full penetration (*) fillet weld. When used on a pipe attached to and supported from a vertical vessel the vessel department supplies the primary support. Coordination of size, type, elevation, orientation, etc. between the piping designer and the vessel group is required. When used on a pipe attached to and supported from a vertical structure the structural department supplies the primary support. Coordination of size, type, elevation, location, etc. between the piping designer and the structural group is required. (*) This full penetration refers to the wall thickness of only the stub pipes not the vertical pipe. The recommended practice for all of these secondary pipe support devices is to determine what is needed. Start out with items that are found to have consistent and repetitive use within the company’s past projects. Document each device complete with parts list and installation instructions. (Documenting also includes the updates required for any electronic design system database, AutoCAD, PDS, PDMS or other) Qualify each device by the specific use criteria based on pipe size, load limitations and application. Define the selection criteria for each based on the qualification criteria. Then train all the piping designers, stress engineers, material group and construction contractors on the responsibility, purpose, use, application and limitations. What about responsibility? Who is responsible for pipe supports or the supporting of the piping? Some may say, “That it is the structural groups responsibility.” That is only partly true. They are only responsible for providing a support of the size; shape and strength based on information given to them. If nobody tells them to put a pipe support (of a specific size, shape and loading) in a specific location they are not going to do it. So, who is responsible for doing the telling? 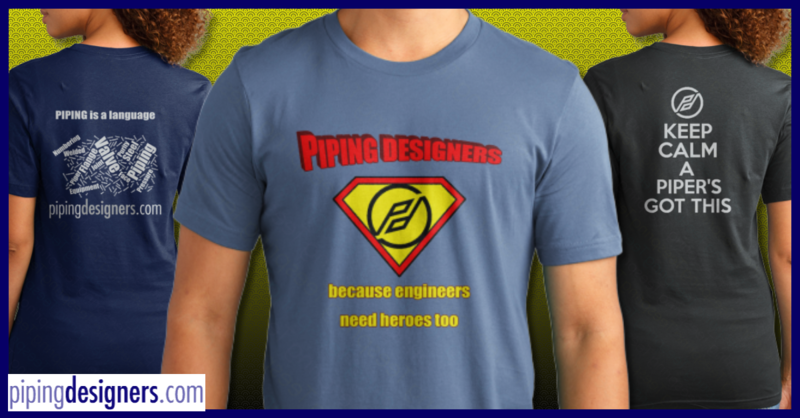 The piping designer is responsible for the piping, which means all the piping and all aspects of all the piping. The piping designer is responsible for telling the structural group what is required for all primary pipe support systems. And, the piping designer is also responsible for telling the structural group when a secondary pipe support device will be attached to and impose a load on a structural member. There are of course other opinions on this subject and there are no doubt questions and more that can be discussed. The other opinions I will warmly accept. And, as for the questions, please ask. If you don’t ask you will never give others a chance to offer answers.